On 30 March 1976, thousands of Palestinians living as a minority in Israel mounted a general strike and organised protests against Israeli government plans to expropriate almost 15,000 acres of Palestinian land in the Galilee. The Israeli government, led by prime minister Yitzhak Rabin and defence minister Shimon Peres, sent in the army to break up the general strike. The Israeli army killed six unarmed Palestinians, wounded hundreds and arrested hundreds more, including political activists. All were citizens of Israel. Palestinians who were internally displaced or managed to remain in their homes during the Zionist ethnic cleansing of 1948 were given citizenship of Israel but kept under military rule until 1966. During those years expropriation of Palestinian land accelerated and Jewish settlement building increased while the Israeli government crushed political organisation and resistance by Palestinians, now a minority on their own land. 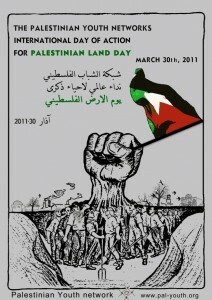 On what became known as Land Day, 30th March 1976 was the first time since 1948 Palestinians inside Israel demonstrated mass resistance against Zionist colonisation and systematic dispossession of Palestinians. Today, Palestinians are 20% of the population of Israel and they, together with Palestinians in the Occupied Territories, continue to struggle against land expropriation, dispossession and systematic segregation, or apartheid. Until today the Israeli government with the help of Zionist organisations such as the Jewish Agency and the Jewish National Fund (JNF) are working to drive Palestinians from their homes and their land to replace them with Jewish settlers and colonies. The JNF is a racist organisation that is complicit in ethnic cleansing and whose activities are an obstacle to a just peace. The JNF branch in the UK has registered charity status despite JNF UK aims and activities violating charity law and the public benefit requirement. While we send our greetings of solidarity on Land Day to Palestinians protesting and in struggle against the colonisation and occupation of their lands, it is important we work here to end JNF UK charity status. On 21st March Stop the JNF submitted an application to Charity Commission offices around the country to remove JNF UK charities from the register. Read reports of the actions at Liverpool, Taunton, Newport and London. Read and endorse the Stop the JNF application. Send a letter to the Charity Commission to end JNF UK charity status. Join / affiliate to Stop the JNF UK. Make a donation to help us continue our solidarity work.